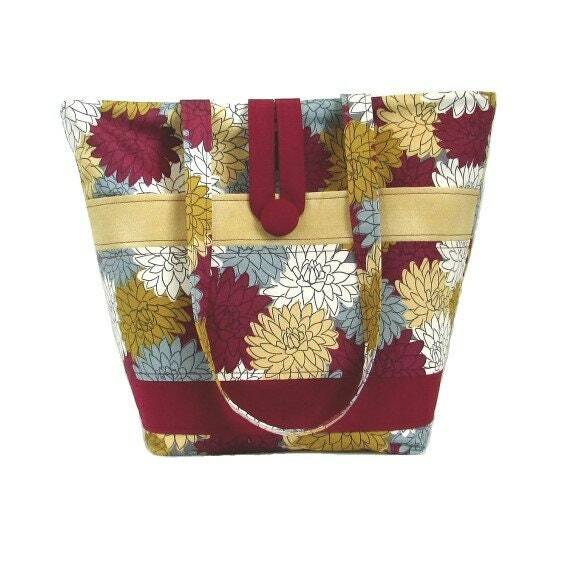 Floral Tote Bag, Cloth Purse has Burgundy, Gray, Brown & White Flowers, with a Front Pocket. This Handmade Bag is fully lined in Gray, has 5 Burgundy slip type Pockets, 2 handles in the same Floral Print as the outside fabric & a Magnetic Snap Closure. The Front pocket is made from the Floral Print Fabric, Burgundy that matches the inside pockets & Light Brown shaded fabric that matches the Flowers. The outside Pocket closes with a Burgundy Fabric covered Button & Loop closure. The Pocket is the width of the bag and 6 1/2 " Deep. I use thick fleece interfacing, sandwiched between the lining & outer fabrics to add stability & durability to this fabric tote bag. This is the perfect size for an everyday purse, book bag, tote bag, craft bag, dance bag, shoulder bag, market bag. This item is Handmade, One of a Kind, Ready to ship. The item in the photographs is the one you will receive. 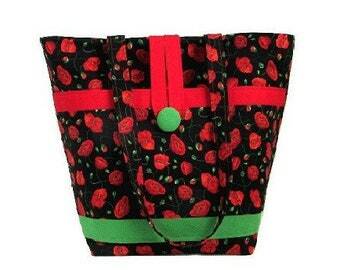 I have several size bags & purses in my shop. Please check the size in the description. For other sizes & styles, check out my other shop sections. Very Cute and made well! I accept all major credit cards, Paypal and Etsy's Direct Checkout. All items listed are ready to ship. The item pictured in the listing is the exact item you will receive. All Items are shipped in 1-3 business days. Shipping Discounts available for combined orders. All Shipping overages will be refunded. I ship First Class International with Tracking & Insurance (where available). Buyer is responsible for any VAT, Customs or Taxes in their Country. Any Overages for shipping multiple items will be refunded. Custom orders require payment in full before any work is started. I strive to provide quality work & great customer service. If you are unhappy with your purchase, please convo me within 3 days of receiving your order so we can set up a Refund or Exchange. Buyer will need to return the item, within 7 days, in the same condition it was sent to you. Buyer is responsible for all shipping costs. If you wish to cancel your order, please notify me within 2 hours of purchase, since I package all orders as soon as they come in so they can be shipped on the first business day after purchase. Refunds will not be given on custom orders. All Items are shipped in 1-3 business days. All items listed are ready to ship. The item pictured in the listing is the exact item you will receive. Purses & Bags are shipped USPS Priority Mail, Insurance and Delivery Confirmation included. Key Fobs are shipped USPS First Class. All Shipping overages for combined orders will be refunded. I search for unusual, high quality fabrics to use in my bags, and only make 1 or 2 of each design. Every Colleens Designs Bag is Handmade, not mass produced. You can be sure you will own something that's truly unique! Thick fleece interfacing sandwiched between outside fabric & lining for Durability, to keep it's shape & stand on it's own.